ww2dbasePrince Egmont of Lippe-Weißenfeld (German: Egmont Prinz zur Lippe-Weißenfeld) was born in Salzburg, Austria in 1918 to Prince Alfred of Lippe-Weißenfeld and Countess Anna of Goëß. As a teenager, he learned glider flying at the Austrian Aero Club, and then received basic flying instructions. He joined the Austrian Army in 1936 and, after the annexation of Austria into Germany, he transferred to the German Luftwaffe. In 1939, he was promoted to the rank of Leutnant. He began his German pilot career as a reconnaissance pilot with the 2nd Group of the Zerstörergeschwader 76 wing before proving himself skillful enough to be a nightfighter pilot. He scored his first victory during the night of 16-17 Nov 1940, shooting down a Wellington bomber of the No. 115 Squadron of the British Royal Air Force at 0205 hours. By Jul 1941, he had achieved 10 victories, and by the end of the year he would be named a squadron commander. During the night of 26-27 Mar 1942, he shot down four British bombers, leading to the award of the Knight's Cross of the Iron Cross in the following month; he had 21 victories at that time. On 1 Oct 1942, he was made a group commander in the Nachtjagdgeschwader 3 wing; in May 1943, he was transferred to be the commander of the 3rd Group of the Nachtjagdgeschwader 1 wing. In Aug 1943, he was awarded Oak Leaves to his Knight's Cross after he had achieved 45 victories. In Jan 1944, he was promoted to the rank of Major and in the following month named the commanding officer of the Nachtjagdgeschwader 5 wing. In Mar 1944, while in flight from Parchim, Germany to Athies-sous-Laon, France, his Bf 110 aircraft crashed in bad weather near Saint-Hubert, Belgium; he was credited with 51 victories at the time of his death. He was buried at Ysselsteyn in the Netherlands next to fellow aristocratic nightfighter pilot Heinrich Prinz zu Sayn-Wittgenstein. 14 Jul 1918 Egmont Prinz zur Lippe-Weißenfeld was born in Salzburg, Austria. 5 Oct 1938 Egmont Prinz zur Lippe-Weißenfeld was awarded the Luftwaffe Pilot's Badget. 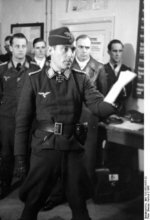 4 Aug 1940 Egmont Prinz zur Lippe-Weißenfeld was transferred to the Nachtjagdgeschwader 1 wing based in Gütersloh, Germany. 17 Nov 1940 Egmont Prinz zur Lippe-Weißenfeld scored his first victory; his victim was a British Wellington bomber. 15 Jan 1941 Egmont Prinz zur Lippe-Weißenfeld achieved his second victory, shooting down a British Whitley bomber over northern Netherlands. 13 Mar 1941 Egmont Prinz zur Lippe-Weißenfeld was wounded in combat. 10 Apr 1941 Egmont Prinz zur Lippe-Weißenfeld shot down a British Wellington bomber shortly after 0000 hours over the IJsselmeer in the Netherlands. 19 Jun 1941 Egmont Prinz zur Lippe-Weißenfeld was mentioned in the Wehrmachtbericht bulletin of the headquarters of the German Wehrmacht. 30 Jun 1941 Egmont Prinz zur Lippe-Weißenfeld's Bf 110 aircraft collided with another Bf 110, piloted by Rudolf Schoenert while in exercise over northern Netherlands. 15 Nov 1941 Egmont Prinz zur Lippe-Weißenfeld was named the commanding officer of the 5th Squadron of the Nachtjagdgeschwader 2 wing. 25 Jan 1942 Egmont Prinz zur Lippe-Weißenfeld was awarded the German Cross in Gold. 28 Jan 1942 Egmont Prinz zur Lippe-Weißenfeld was mentioned in the Wehrmachtbericht bulletin by the headquarters of the German Wehrmacht. 26 Mar 1942 During this night and into the first hours of the next day, Egmont Prinz zur Lippe-Weißenfeld shot down four British bombers, increasing his victories to 21. 27 Mar 1942 Egmont Prinz zur Lippe-Weißenfeld, having shot down four British bombers during the previous night, was mentioned in the Wehrmachtbericht bulletin by the headquarters of the German Wehrmacht. 16 Apr 1942 Egmont Prinz zur Lippe-Weißenfeld was awarded the Knight's Cross of the Iron Cross. 1 Oct 1942 Egmont Prinz zur Lippe-Weißenfeld was named the commanding officer of the 1st Group of the Nachtjagdgeschwader 3 wing. 31 May 1943 Egmont Prinz zur Lippe-Weißenfeld was named the commanding officer of the 3rd Group of the Nachtjagdgeschwader 1 wing. 2 Aug 1943 Egmont Prinz zur Lippe-Weißenfeld was awarded Oak Leaves to his Knight's Cross of the Iron Cross. 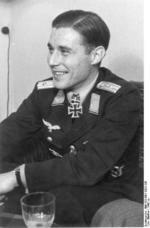 20 Feb 1944 Egmont Prinz zur Lippe-Weißenfeld was named the wing commander of Nachtjagdgeschwader 5. 12 Mar 1944 Egmont Prinz zur Lippe-Weißenfeld died near Saint-Hubert, Belgium where his Bf 110 aircraft crashed in poor weather. You have this man dying on 22 March 1944. Several other webpages report it being 12 March, and his funeral on 15 March. Tom Lee: Thank you, we have made the correction to the date of his death.